Update: Video of Glenn Beck and Mark Stein on Obama’s socialist agenda and shocking racial audio from Obama himself. image thanks to Michelle Malkin. Wow! I go out on one Friday night and the gaffe of the election season takes place! Here is the transcript via Huffington Post…they also have the audio in Obama’s own voice. 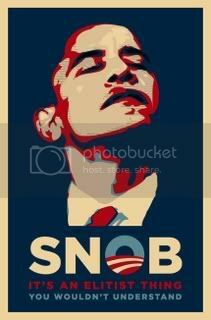 I can sum this up for everyone in very few words….elitist, condescending liberal snob! Michelle Malkin coins the moniker SnOb-ama! Wow, I’m so late on this news the best I can offer is to round up other reactions. I’ll start by stealing from Hot Air. ….and Hillary joins the pile-on fun! Gateway Pundit has audio of Obama’s response.